I’m so excited to bring another look by Pink Blush in their coveted floral print dress! Their dresses have been my favorite go-to during pregnancy & post partum; I constantly get compliments on their stunning prints. Their dresses provides the most flattering drape everytime, no matter what stage (it’s also what I wore in the hospital maternity ward)! This dress is so perfect for motherhood as it’s extremely nursing friendly. 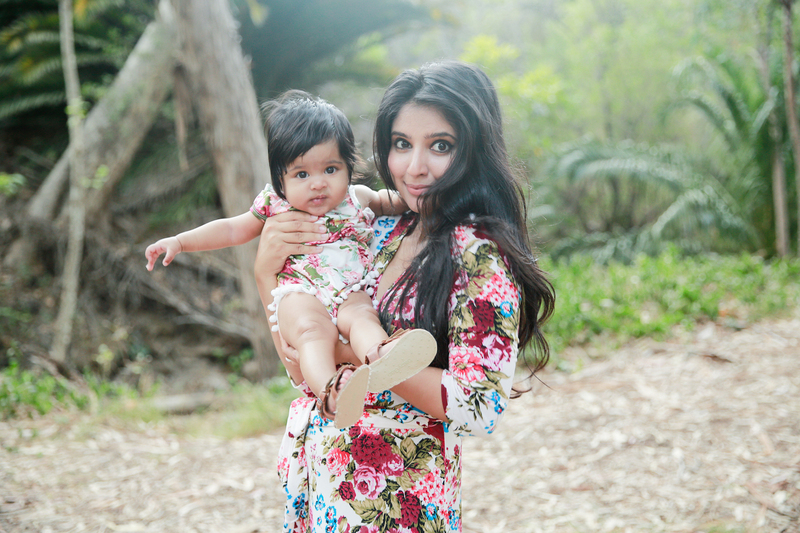 I’ve also collaborated with Bailey’s Blossoms for Sareena’s adorable matching pompom romper! She has built the sweetest collection of their beautiful rompers and has one in almost every style. We’re hooked! 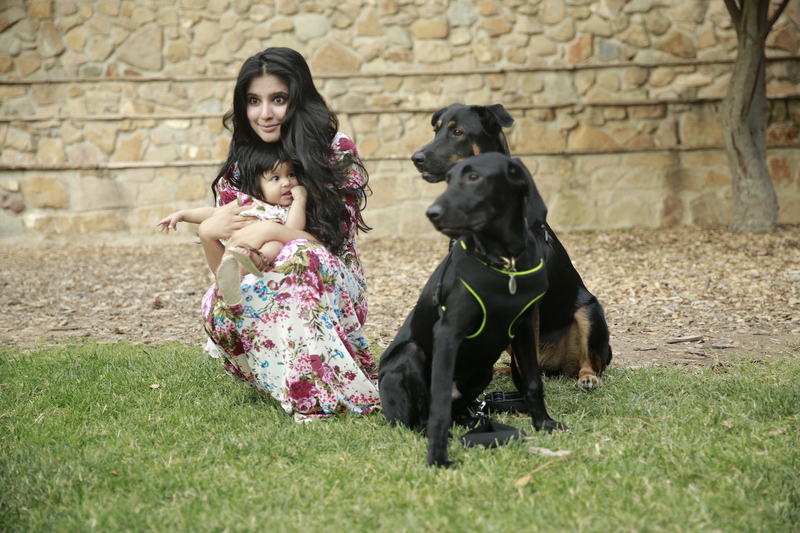 Ps Sareena is totally in love with the family pups.. she can’t get enough of them! You both look beautiful! Love the prints on the dresses! This dress is so amazing! I hope to work with pink blush during my pregnancy as well because their items are gorgeous. Looking cute twinning with your little. Love the matching outfits! So gorgeous!!! Too cute!! Love the matching. Such perfect photos. Love the floral print, it’s very striking. So cute!! Love these shots! This is one of the cutest post I have ever seen, your dress is gorgeous and I love how you and your daughter match! She is so adorable, you both look gorgeous in your dresses . Those colors are beautiful on you and your mini! That pattern is perfect for summertime Just gorgeous! I love all your baby and mommy outfits! Aw, how cute is this, Shveta! You look so gorgeous, as always, and Sareena looks so adorable! I love how you’ve been matching her with your looks. The dress is absolutely beautiful and I’m sure it’s an awesome feeling to wear something so beautiful that’s also practical for nursing, too! I remember greatly admiring your pregnancy style and you’ve been looking just as amazing post pregnancy! 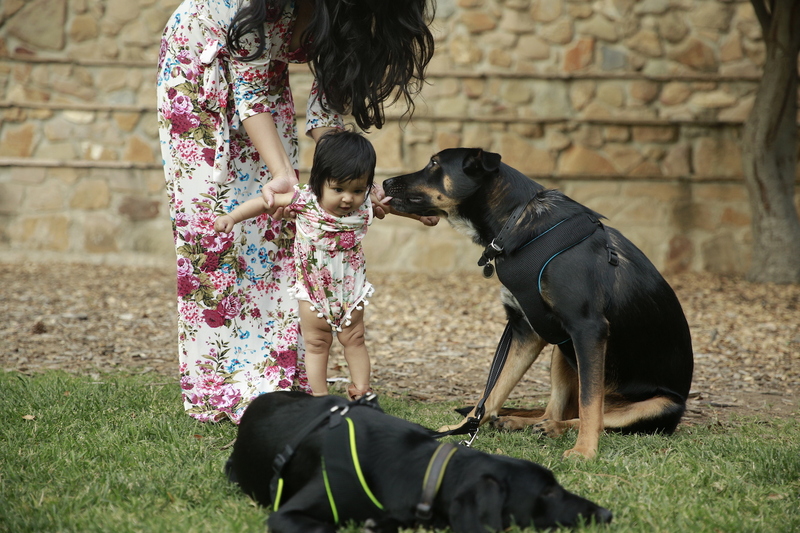 You can tell that Sareena is in love with the pups, especially in the last two photos, so cute! Thanks so much for sharing, gorgeous girlie, and I hope you’re having the best week so far! 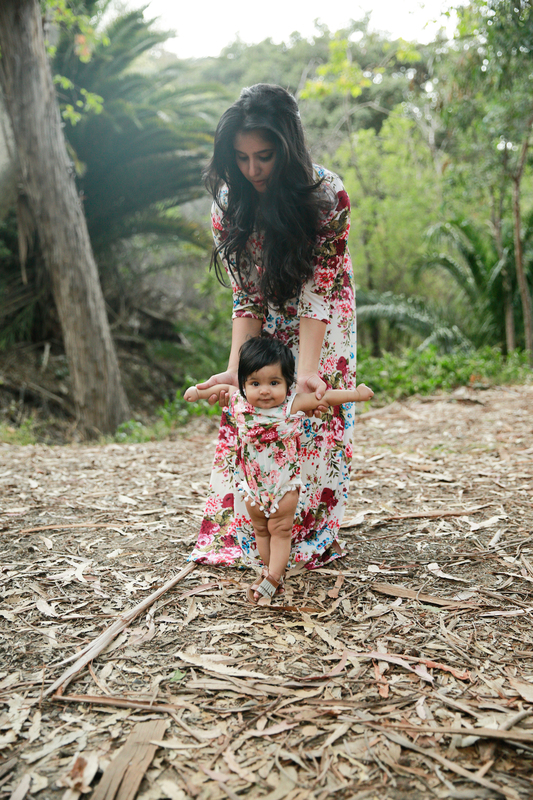 Such a pretty dress on you, lady- and Sareena’s little pompoms are too cute! Gorgeous girls! Great styling darling! Thanks for sharing! I JUST CANT GET ENOUGH OF SAREENA!! <3 luv this post! You two are the cutest, most fabulous duo. I can’t even deal with Sareena, my heart is exploding! 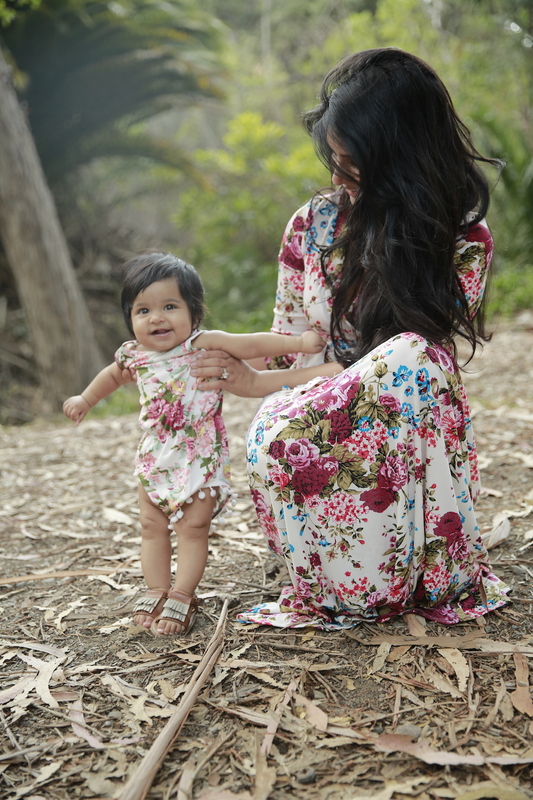 This dress is so stunning and woow you and your daughter are so lovely with theses flower prints ! She is super adorable! And you look stunning! Such lovely pink blush dress. I love this pattern, it looks so bright and colourful. You both are looking gorgeous. LOVE how you both look in matching floral prints! So sweet 😉 Have a lovely week Shveta! It is so cool that the prints of both the outfits almost match completely. Both of you look adorable! It is so good to be around with the pets who are so loving. So Beautiful look, truly you two are the cutest. 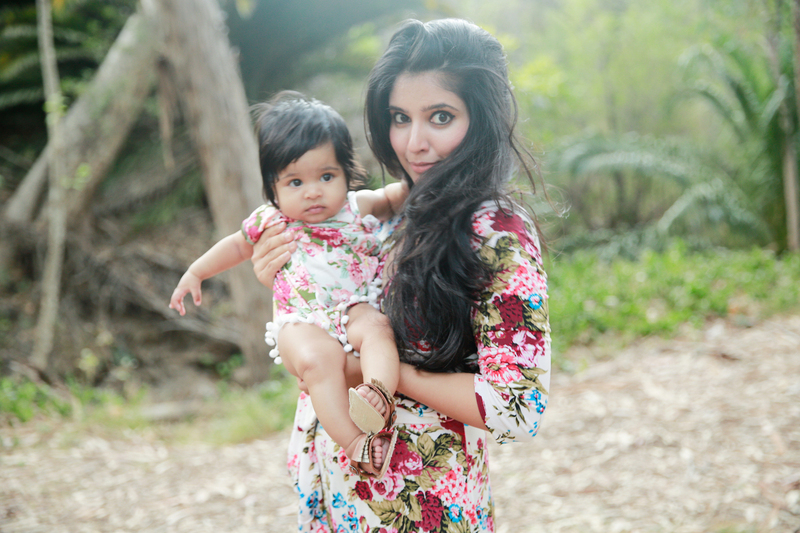 You’re both beautiful in florals, adorable mum and baby tandem. awww, how adorable are you both?! The prints on both of your outfits are stunning. And I can’t believe how fast she’s growing already! I remember she was a tiny baby not too long ago. Beautiful you two!